A uniquely stylish actor, in British films for over 30 years. Not conventionally handsome, Eric Portman became an unlikely box-office attraction in the 1940s, when audiences admired his polished, distinctive voice (both gritty and reedy) and portrayals of disturbed, complex characters. He was not really a 1940s film star of the Granger and Mason ilk, perhaps because his persona was cold and remote, with a sinister edge. His characters (cashiered army officers, struck-off doctors, etc) often had aspects they wished to hide, or were obsessive, sucessfully tapping into Portman's persona. On stage from 1924, and in films from 1933, he finally made a big impression with critics and public as calculating Nazi U-Boat commander, Hirth, journeying across Canada to the still-neutral USA, in 49th Parallel (1941) for Powell and Pressburger . They used him again as one of the British Bomber crew in One of Our Aircraft is Missing (1942), and as the unconventional Kentish sage Colpeper JP in A Canterbury Tale (1944), a definitive Portman role. In the 1940s, Portman 's roles often fell into one of two types: blunt, straight-talking Yorkshiremen (the factory foreman in Millions Like Us , (d. Launder & Gilliat, 1943)), or obsessed, calculating murderers ( Wanted for Murder (d. Lawrence Huntington, 1946); Dear Murderer (d. Arthur Crabtree, 1947)). 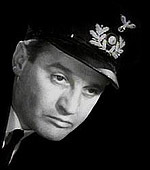 Excellent in The Spider and the Fly (d. Robert Hamer, 1949), as the police chief engaged in a tense duel of wits with safecracker Guy Rolfe , he was memorable in such 1950s roles as the imprisoned Colonel in The Colditz Story (d. Guy Hamilton, 1954), the discredited doctor in The Deep Blue Sea (Anatole Litvak, 1955), and a forthright and touching Jess Oakroyd in The Good Companions (d. J. Lee Thompson, 1956). As starring roles became fewer, he returned to the London and New York stages with great success in Separate Tables (1954). In the 1960s he guested in the TV series The Prisoner (ATV, 1967), and appeared in two films for Bryan Forbes , The Whisperers (1966) as Edith Evans ' no-good husband, and Deadfall (1967), in which he gave a brave, touching performance as an ageing homosexual safecracker. Portman , fiercely protective of his private life, in later years lived quietly in remote Cornwall between assignments.